Imagine a bit of rolling country—rather like parts of Leicestershire,—fair-sized fields, separated mostly by straggling fences interspersed with wire (largely barbed), and punctuated by tall trees. Patches of wood in places, spinney size for the most part. Low hills here and there—;Kemmel, Scherpenberg, Ploegsteert Wood,—but all outside our area. For villages, Dranoutre, Neuve Église, Wulverghem, and Lindenhoek, of which the two last were already more than half shot to pieces and almost deserted. Opposite our right was Messines—a mile and a half in front of our line,—its big, square, old church tower still standing; it may have had a spire on the top, but if so it had disappeared before we came. Nearly opposite our extreme left, but out of our jurisdiction and in the sphere of the Division on our left, was Wytschaete (pronounce Wich Khâte), one and a half miles off. who liked the good things of this world … and did not disdain to make the acquaintance of an occasional tot of British rum or whisky, except on Fridays. The Dorsets received orders to gauge the Germans’ strength in front of them. Another quiet day is reported in the diary. The Germans kept them on their toes during the night with two outbursts of rifle fire. At home the Daily Telegraph reports the war has gone quiet in France and Belgium all along the line. The newspaper is still banging on about Christmas present ideas for the men. Peppermint lozenges and perfumed soap (bad breath and B.O. being a big no no when hunkered down in a stinking trench) should included be offered as small gifts for those family members who are “maintaining the honour of the Country”. There are also recipes for feeding wounded soldiers. What they do to a fillet steak possibly breaks the Geneva Convention. After the steak has been hammered flat and fried for 10 to 15 minutes I am sure the men could have used it as a bullet proof vest. Thankfully, a letter from Ethel Jonson offers to set up a society to put recent Belgian refugees* to good use and teach the English to cook. She labels English cuisine as being “lamentably inferior to that of Continental cookery”. Plus ça change. *Did they get tax credits, I wonder? Today’s diary entry is very short, simply recording a quiet night, less sniping and a quiet day. 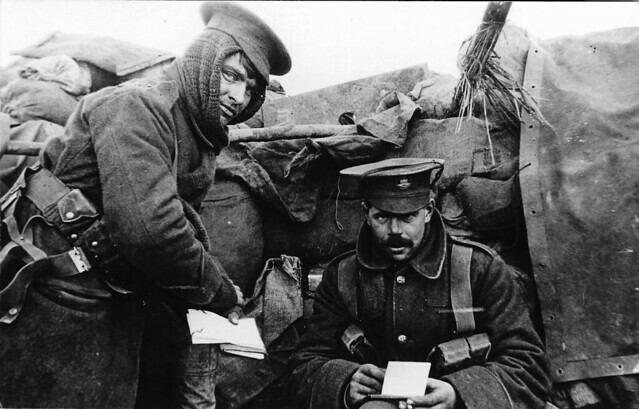 What the diary doesn’t record is the relief of the Worcesters (3rd Bn) to their right. Knowing this to be the case, today’s map, which I mentioned a couple of days ago, shows the Worcesters as being on the Dorsets’ right. So the map must have been drawn between the 25th and 28th November 1914. The map is my version of the drawing of Major Fraser’s map from the 14th Division diary for November 1914 (WO-95-1560-2_3 page 11). Officers of the replacement battalion arrived during the afternoon and completed the relief at 11.25pm. The Dorsets already had the Norfolks to their left. Now they had the Bedfords to their right. Was the 15th Brigade getting back together? The Dorsets spent the night improving their trenches. In the morning the reserve trenches were heavily shelled. This was B Company which was just behind Battalion HQ. The rest of the day was quiet. According to the war diary 1 man was killed and 3 are wounded. No deaths are listed on the CWGC website for the 27th November 1914 and I can’t find anything on Ancestry for that date. There was heavy rifle and machine gun fire from the Germans in the night which had died down by the morning. But no attack was made. This pattern of rifle fire at night rising “to a roar on both sides” is recorded in The History of the Dorsetshire Regiment 1914-1918. More orders were received from 14th Brigade about counter sniping. Frank, as a marksman, would surely have been involved in this activity. The trenches were so close that I imagine not having sights didn’t really make much difference. I have a hand drawn map signed by Major Fraser that I am currently redrawing (I’m not sure of the copyright issue with Public Record Office scans) which shows the German lines as close as 50 yards in places (46 metres in new money). I am not sure of the date but it looks like it was copied from one drawn by the East Surreys on the 20th November so it can’t be too far after today’s date. Later Dorset trench maps change orientation from landscape to portrait. Although little shelling was reported along the 14th Brigade’s sector, at around 2pm a large amount of shells landed over the Dorset stretch of the line. 10 out of the 16 shells didn’t explode – or were “blind” as the 14th Brigade’s diary puts it. This is also recorded in the Dorsets’ diary in less detail. 3 Dorset men were killed with 4 wounded. The CWGC records more: 6 men died, although one of them is buried up in Balleuil so may have died of wounds. The Dorsets’ diary records “situation quiet”. I think quiet is a relative term here.